Now that we have arrived at the week which has been noted in the predictive linguistic work for a year (or arguably longer, if we count the 'death of the dollar' theme to play out in November which could be this one), it's time to pencil out what the process of actually living through a "Greater Depression" as my friend Jas Jain calls this one, will be. I won't kid you - it's likely to be every bit as bad as the 1930's - or even worse - since this is a Grand Super Cycle event of a greater degree; than the last Depression - that 1930's event. As I wrote on Saturday on the free www.urbansurvival.com site, I expect that European bank failures may be the 'triggering event' and just like clockwork, the combination of our rickety time machine and some pretty good sources informed us within a few hours that there'd not only be "No banks bailout fund for Europe" but by Sunday morning we had our first report of a "German bank at risk of collapse". Like my friend "The Bond Dude" explained: This whole CDS market (all $55-60-trillion worth) is like a fence with 10-million links. 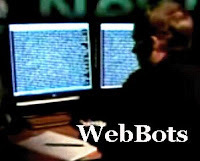 It only takes one of them to break and things could cascade from there..."
Just What are the web bots? Amazing. The first ever global depression will go down in history horribly misunderstood. What a pathetic bunch of ignorant fools we have become. Consumer junkie credit card morons. Perfect little victims. Say that reminds me. Don’t believe one optimistic word from any public figure about the economy or humanity in general. They are all part of the problem. Its like a game of Monopoly. In America, the richest 1% now hold ALMOST 1/2 OF ALL UNITED STATES WEALTH. Unlike ‘lesser’ estimates, this includes all stocks, bonds, cash, offshore accounts, and material assets held by America’s richest 1%. Even that filthy pig Oprah acknowledged that it was at about 50% in 2006. Naturally, she put her own ‘humanitarian’ spin on it. Calling attention to her own ‘good will’. WHAT A DISGUSTING HYPOCRITE SLOB. THE RICHEST ONE PERCENT HAVE LITERALLY MADE WORLD PROSPERITY ABSOLUTELY IMPOSSIBLE. Don’t fall for any of their ‘humanitarian’ CRAP. ITS A SHAM. THESE PEOPLE ARE CAUSING THE SAME PROBLEMS THEY PRETEND TO CARE ABOUT. Ask any professor of economics. Money does not grow on trees. The government can’t just print up more on a whim. At any given time, there is a relative limit to the wealth within ANY economy of ANY size. So when too much wealth accumulates at the top, the middle class slip further into debt and the lower class further into poverty. A similar rule applies worldwide. The world’s richest 1% now own over 40% of ALL WORLD WEALTH. This is EVEN AFTER you account for all of this ‘good will’ ‘humanitarian’ BS from celebrities and executives. ITS A SHAM. As they get richer and richer, less wealth is left circulating beneath them. This is the single greatest underlying cause for the current US recession. The middle class can no longer afford to sustain their share of the economy. Their wealth has been gradually transfered to the richest 1%. One way or another, we suffer because of their incredible greed. We are talking about TRILLIONS of dollars which have been transfered FROM US TO THEM. All over a period of about 27 years. Thats Reaganomics for you. The wealth does not ‘trickle down’ as we were told it would. It just accumulates at the top. Shrinking the middle class and expanding the lower class. Causing a domino effect of socio-economic problems. But the rich will never stop. They just keep getting richer. Leaving even less of the pie for the other 99% of us to share. At the same time, they throw back a few tax deductible crumbs and call themselves ‘humanitarians’. Cashing in on the PR and getting even richer the following year. IT CAN’T WORK THIS WAY. Their bogus efforts to make the world a better place can not possibly succeed. Any ‘humanitarian’ progress made in one area will be lost in another. EVERY SINGLE TIME. IT ABSOLUTELY CAN NOT WORK THIS WAY. This is going to end just like a game of Monopoly. The current US recession will drag on for years and lead into the worst US depression of all time. The richest 1% will live like royalty while the rest of us fight over jobs, food, and gasoline. So don’t fall for any of this PR CRAP from Hollywood, Pro Sports, and Wall Street PIGS. ITS A SHAM. Remember: They are filthy rich EVEN AFTER their tax deductible contributions. Greedy pigs. Now, we are headed for the worst economic and cultural crisis of all time. Crime, poverty, and suicide will skyrocket. SEND A “THANK YOU” NOTE TO YOUR FAVORITE MILLIONAIRE. ITS THEIR FAULT. I’m not discounting other factors like China, sub-prime, or gas prices. But all of those factors combined still pale in comparison to that HUGE transfer of wealth to the rich. Anyway, those other factors are all related and further aggrivated because of GREED. If it weren’t for the OBSCENE distribution of wealth within our country, there never would have been such a market for sub-prime to begin with. IF IT WEREN’T FOR THE OBSCENE, UNREASONABLE, AND UNJUST DISTRIBUTION OF UNITED STATES WEALTH, THERE NEVER WOULD HAVE BEEN SUCH A MARKET FOR SUB-PRIME AND THERE NEVER WOULD HAVE BEEN A COLLAPSE IN THE HOUSING MARKET. Sub-prime did not cause the problem. It only accelerated the outcome. Which by the way, was another trick whipped up by greedy bankers and executives. IT MAKES THEM RICHER. The credit industry has been ENDORSED by people like Oprah Winfrey, Ellen DeGeneres, Dr Phil, and many other celebrities. IT MAKES THEM RICHER. In fact, they specifically endorsed Countrywide by name. The same Countrywide widely responsible for predatory adjustable rate sub-prime lending and the accelerated collapse of the housing market. ENDORSED BY OPRAH WINFREY, ELLEN DEGENERES, AND DR PHIL. Now, there are commercial ties between nearly every industry and every public figure. IT MAKES THEM RICHER. It also drives up the cost for nearly every product and service on the market. So don’t fall for their ‘good will’ BS. ITS A LIE. If you fall for it, then you’re a fool. If you see any real difference between the moral character of a celebrity, politician, attorney, or executive, then you’re a fool. No offense fellow citizens. But we have been mislead by nearly every public figure. We still are. Even now, they claim to be ‘hurting’ right along with the rest of us. As if gas prices actually effect the lifestyle of a millionaire. ITS A LIE. IN 2007, THE RICHEST 1% INCREASED THEIR AVERAGE BOTTOM LINE WEALTH AGAIN. On average, they are now worth over $4,000,000 each. Thats an all time high. As a group, they are now worth well over $17,000,000,000,000. THATS WELL OVER SEVENTEEN TRILLION DOLLARS. Another all time high. Which by the way, is much more than the entire middle and lower classes combined. Also more than enough to pay off our national debt, fund the Iraq war for a decade, repair our infrastructure, and bail out the US housing market. Still think that our biggest problem is China? Think again. Its the 1% club. That means every big name celebrity, athlete, executive, entrepreneur, developer, banker, and lottery winner. Along with many attorneys, doctors, and politicians. If they are rich, then they are part of the problem. Their incredible wealth was not ‘created’, ‘generated’, grown in their back yard, or printed up on their command. It was transfered FROM US TO THEM. Directly and indirectly. Its become near impossible to spend a dollar without making some greedy pig even richer. Don’t be fooled by the occasional loss of a millionaire’s fortune. Overall, they just keep getting richer. They absolutely will not stop. Still, they have the nerve to pretend as if they care about ordinary people. ITS A LIE. NOTHING BUT CALCULATED PR CRAP. WAKE UP PEOPLE. THEIR GOAL IS TO WIN THE GAME. The 1% club will always say or do whatever it takes to get as rich as possible. Without the slightest regard for anything or anyone but themselves. Reaganomics. Their idea. Loans from China. Their idea. NAFTA. Their idea. Outsourcing. Their idea. Sub-prime. Their idea. High energy prices. Their idea. Oil ‘futures’. Their idea. Obscene health care charges. Their idea. The commercial lobbyist. Their idea. The multi-million dollar lawsuit. Their idea. The multi-million dollar endorsement deal. Their idea. $200 cell phone bills. Their idea. $200 basketball shoes. Their idea. $30 late fees. Their idea. $30 NSF fees. Their idea. $20 DVDs. Their idea. Subliminal advertising. Their idea. Brainwash plots on TV. Their idea. Vioxx, and Celebrex. Their idea. Excessive medical testing. Their idea. The MASSIVE campaign to turn every American into a brainwashed, credit card, pharmaceutical, medical testing, love-sick, celebrity junkie. Their idea. All of the above drive up the cost of living, shrink the middle class, concentrate the world’s wealth and resources, create a dominoe effect of socio-economic problems, and wreak havok on society. All of which have been CREATED AND ENDORSED by celebrities, athletes, executives, entrepreneurs, attorneys, and politicians. IT MAKES THEM RICHER. So don’t fall for any of their ‘good will’ ‘humanitarian’ BS. ITS A SHAM. NOTHING BUT TAX DEDUCTIBLE PR CRAP. In many cases, the ‘charitable’ contribution is almost entirely offset. Not to mention the opportunity to plug their name, image, product, and ‘good will’ all at once. Which is usually done just before or after the release of their latest commercial project. IT MAKES THEM RICHER. These filthy pigs even have the nerve to throw a fit and spin up a misleading defense with regard to ‘federal tax revenue’. ITS A SHAM. THEY SCREWED UP THE EQUATION TO BEGIN WITH. If the middle and lower classes had a greater share of the pie, they could easily cover a greater share of the federal tax revenue. They are held down in many ways because of greed. Wages remain stagnant for millions because the executives, celebrities, athletes, attorneys, and entrepreneurs, are paid millions. They over-sell, over-charge, under-pay, outsource, cut jobs, and benefits to increase their bottom line. As their profits rise, so do the stock values. Which are owned primarily by the richest 5%. As more United States wealth rises to the top, the middle and lower classes inevitably suffer. This reduces the potential tax reveue drawn from those brackets. At the same time, it wreaks havok on middle and lower class communities and increases the need for financial aid. Not to mention the spike in crime because of it. There is a dominoe effect to consider. IT CAN’T WORK THIS WAY. But our leaders refuse to acknowledge this. Instead they come up with one trick after another to milk the system and screw the majority. These decisions are heavily influensed by the 1% club. Every year, billions of federal tax dollars are diverted behind the scenes back to the rich and their respective industries. Loans from China have been necessary to compensate in part, for the red ink and multi-trillion dollar transfer of wealth to the rich. At the same time, the feds have been pushing more financial burden onto the states who push them lower onto the cities. Again, the hardship is felt more by the majority and less by the 1% club. The rich prefer to live in exclusive areas or upper class communities. They get the best of everything. Reliable city services, new schools, freshly paved roads, upscale parks, ect. The middle and lower class communities get little or nothing without a local tax increase. Which, they usually can’t afford. So the red ink flows followed by service cuts and lay-offs. All because of the OBSCENE distribution of bottom line wealth in this country. Anyway, when you account for all federal, state, and local taxes, the middle class actually pay about the same rate as the rich. The devil is in the details. So when people forgive the rich for their incredible greed and then praise them for paying a greater share of the FEDERAL income taxes, its like nails on a chalk board. I can not accept any theory that our economy would suffer in any way with a more reasonable distribution of wealth. Afterall, it was more reasonable 30 years ago. Before Reaganomics came along. Before GREED became such an epidemic. Before we had an army of over-paid executives, bankers, celebrities, athletes, attorneys, doctors, investors, entrepreneurs, developers, and sold-out politicians to kiss their asses. As a nation, we were in much better shape. Strong middle class, free and clear assets, lower crime rate, more widespread prosperity, stable job market, lower deficit, ect. Our economy as a whole was much more stable and prosperous for the majority. WITHOUT LOANS FROM CHINA. Now, we have a more obscene distribution of bottom line wealth than ever before. We have a sold-out government, crumbling infrastructure, energy crisis, home forclosure epidemic, credit crunch, weak US dollar, 13 figure national deficit, and 12 figure annual shortfall. The cost of living is higher than ever before. Most people can’t even afford basic health care. ALL BECAUSE OF GREED. I really don’t blame the 2nd -5th percentiles in general. No economy could ever function without some reasonable scale of personal wealth and income. But it can’t be allowed to run wild like a mad dog. ALBERT EINSTEIN TRIED TO MAKE PEOPLE UNDERSTAND. UNBRIDLED CAPITALISM ABSOLUTELY CAN NOT WORK. TOP HEAVY ECONOMIES ALWAYS COLLAPSE. Bottom line: The richest 1% will soon tank the largest economy in the world. It will be like nothing we’ve ever seen before. The American dream will be shattered. and thats just the beginning. Greed will eventually tank every major economy in the world. Causing millions to suffer and die. Oprah, Angelina, Brad, Bono, and Bill are not part of the solution. They are part of the problem. THERE IS NO SUCH THING AS A MULTI-MILLIONAIRE HUMANITARIAN. EXTREME WEALTH MAKES WORLD PROSPERITY ABSOLUTELY IMPOSSIBLE. WITHOUT WORLD PROSPERITY, THERE WILL NEVER BE WORLD PEACE OR ANYTHING EVEN CLOSE. GREED KILLS. IT WILL BE OUR DOWNFALL. Of course, the rich will throw a fit and call me a madman. Of course, they will jump to small minded conclusions about ‘jealousy’, ‘envy’, or ’socialism’. Of course, their ignorant fans will do the same. You have to expect that. But I speak the truth. If you don’t believe me, then copy this entry and run it by any professor of economics or socio-economics. Then tell a friend. Call the local radio station. Re-post this entry or put it in your own words. Be one of the first to predict the worst economic and cultural crisis of all time and explain its cause. WE ARE IN BIG TROUBLE. So what can we do about it? Well, not much. Unfortunately, we are stuck on a runaway train. The problem has gone unchecked for too many years. The US/global depression is comming thanks to the 1% club. It would take a massive effort by the vast majority to prevent it. Along with a voluntary sacrifice by the rich. THATS NOT GOING TO HAPPEN. But if you believe in miracles, then spend your money as wisely as possible. Especially in middle and lower class communities. Check the Fortune 500 list and limit your support of high profit/low labor industries (Hollywood, pro sports, energy, credit, pharmaceutical, cable, satelite, internet advertising, cell phone, high fashion, jewelry, ect.). Cancel all but one credit card for emergencies only. If you need a cell phone, then do your homework and find the best deal on a local pre-pay. If you want home internet access, then use the least expensive provider, and share accounts whenever possible. If you need to search, then use the less popular search engines. They usually produce the same results anyway. Don’t click on any internet ad. If you need the product or service, then look up the phone number or address and contact that business directly. Don’t pay to see any blockbuster movie. Instead, wait a few months and rent the DVD from a local store or buy it USED. If you want to see a big name game or event, then watch it in a local bar, club, or at home on network TV. Don’t buy any high end official merchendise and don’t support the high end sponsors. If its endorsed by a big name celebrity, then don’t buy it. If you can afford a new car, then make an exception for GM, Ford, and Dodge. If they don’t increase their market share soon, then a lot more people are going to get screwed out of their pensions and/or benefits. Of course, you must know by now to avoid those big trucks and SUVs unless you truly need one for its intended purpose. Don’t be ashamed to buy a foreign car if you prefer it. Afterall, those with the most fuel efficient vehicles consume a lot less foreign oil. Which accounts for a pretty big chunk of our trade deficit. Anyway, the global economy is worth supporting to some extent. Its the obscene profit margins, trade deficits, and BS from OPEC that get us into trouble. Otherwise, the global economy would be a good thing for everyone. Just keep in mind that the big 3 are struggling and they do produce a few smaller reliable cars. Don’t frequent any high end department store or any business in a newly developed upper class community. By doing so, you make developers richer and draw support away from industrial areas and away from the middle class communities. Instead, support the local retailer and the less popular shopping centers. Especially in lower or middle class communities. If you can afford to buy a home, then do so. But go smaller and less expensive. Don’t get yourself in too deep and don’t buy into the newly developed condos or gated communities. Instead, find a modest home in a building or neighborhood at least 20 years old. If you live in one of the poorer states, then try to support its economy first and foremost. Be on the lookout for commercial brainwash plots on TV. They are written into nearly every scene of nearly every show. Most cater to network sponsors and parent companies. Especially commercial health care. Big business is fine on occasion depending on the profit margins and profit sharing. Do your homework. If you want to support any legitimate charity, then do so directly. Never support any celebrity foundation. They spend most of their funding on PR campaigns, travel, and high end accomodations for themselves. Instead, go to Charitywatch.org and look up a top rated charity to support your favorite cause. In general, support the little guy as much as possible and the big guy as little as possible. Do your part to reverse the transfer of wealth away from the rich and back to the middle and lower classes. Unfortunately, there is no perfect answer. Jobs will be lost either way. Innocent children will starve and die either way. But we need to support the largest group of workers with the most reasonable profit margins. We also need to support LEGITIMATE charities (Check that list at Charitywatch.org). This is our only chance to limit the severity and/or duration of the comming US/global depression. In the meantime, don’t listen to Bernanke, Paulson, Bartiromo, Orman, Dobbs, Kramer, OReiley, or any other public figure with regard to the economy. They are all plenty smart but I swear to you that they will lie right through their rotten teeth. IT MAKES THEM RICHER. These people work for big business. The ‘experts’ they cite also work for big business. They are all motivated by their desire to accumulate more wealth. THEY WILL LIE RIGHT THROUGH THEIR ROTTEN TEETH. So don’t fall for their tricks. Instead, look at the big picture. The economic problems we face have been mounting for well over 20 years. All of them caused or aggrivated by a constant transfer of wealth from poorer to richer. Soon, it will cause the first ever GLOBAL DEPRESION. Its not brain surgery. Its simple math. Like I said, you are welcome to run this by any professor of economics or socio-economics. If thats not good enough, then look up what Einstein had to say about greed, extreme wealth, and its horrible concequences. I speak the truth. GREED KILLS. IT WILL BE OUR DOWNFALL. Its already underway. A massive campaign to divert our attention. Trump, Buffet, OReiley, Dobbs, Pickens, Norris, and several other well known filthy rich public figures have been running their mouths about the economy. Finally admitting a hint of severity after almost 2 years of denial. They even have the nerve to acknowledge the possibility of a US/global depression. Still, they refuse to acknowledge the single greatest underlying cause. Remember: Our national debt was way up BEFORE sub-prime. Consumer debt was way up BEFORE sub-prime. The cost of living was up BEFORE sub-prime. Wall Street profits were obscene BEFORE sub-prime. The middle class were loosing free and clear assets BEFORE sub-prime. Our infrastructure was in bad shape BEFORE sub-prime. Loans from China were taken out BEFORE sub-prime. The dollar was loosing value BEFORE sub-prime. So don’t let these cowardly filthy rich public figures divert your attention or limit your range of thought. THE CURRENT ECONOMIC CRISIS WAS NOT CAUSED BY A SINGLE POLICY OR PROCEDURE. IT WAS CAUSED PRIMARILY BY A MASSIVE TRANSFER OF WEALTH FROM POOR TO RICH. THIS ALSO REPRESENTS A MASSIVE CONCENTRATION OF CAPITAL WORLDWIDE. OTHERWISE, THERE WOULD NOT HAVE BEEN SUCH A MARKET FOR SUB-PRIME AND THERE WOULD NOT HAVE BEEN A GLOBAL CREDIT CRUNCH. MONEY DOES NOT GROW ON TREES AND IT DOES NOT JUST FLOAT AWAY. IT ONLY TRANSFERS FROM ONE PARTY TO ANOTHER. ALBERT EINSTEIN TRIED TO MAKE PEOPLE UNDERSTAND. GREED KILLS. IT WILL BE OUR DOWNFALL. A word for those who respond with the usual ‘I know more than you. Look how smart, knowledgable, and articulate I am’ crap. Let me say this in advance. I don’t claim to be an expert in this field. But I did go on record with these predictions long before any public figure uttered the word ‘recession’. If you search long enough, you will find my early postings from ‘05′ and ‘06′. Including the first draft of this rant. Since then, I’ve gone on record against people like Greenspan, Bernanke, and Paulson. So far, my predictions have been accurate. Like I said. This is not brain surgery. For the mostpart, its simple math. When you concentrate the world’s wealth, you also concentrate its capital and shrink the middle class along with the potential market for every major industry. Homes go unsold. Bills go unpaid. Banks fail. More products go unsold. Jobs are lost. More banks fail. and so on. and so on. It happened 80 years ago. It will happen again. This time on a global scale. Throughout the cycle, the rich will tighten their grip. Concentrating the world’s wealth and resources even further and ensuring the collapse of every major economy worldwide. Think it can’t happen? Think again. GREED KILLS. IT WILL BE OUR DOWNFALL. Another thing. I don’t want credit for any of this. Otherwise, I would have given my full name a long time ago. As far as I’m concerned, you can put this rant in your own words and take credit for all of it. I don’t care. Just spread the word. Otherwise, the greatest injustice of all time will go down in history unchecked. By the way. The bailout won’t work. IT WON’T WORK. The plan fails to address the fundamental problem. The middle class don’t need more credit. They need a reasonable share of the economic pie. They also need a lower cost of living and a chance to catch their breath. They need a break from all of the psychological marketing tricks and mass market BS. Most of all, they need to wake up and see the truth. GREED KILLS. IT WILL BE OUR DOWNFALL. To my surprise, two public figures have found the courage to acknowledge this problem to some degree. On 11.07.07 former presidential candidate Ron Paul mentioned the massive transfer of wealth from poor to rich. He also hinted at the possibility of economic collapse. He did so on 'Face the Nation'. He was blacklisted almost immediately for doing so. On 9.28.08 former secretary of labor Robert Reich refered to the obscene levels of income inequality as part of a "recipe for disaster". He mentioned the richest one percent in particular. He did so on 'Late Night With Conan OBrien'. As far as I know, Albert Einstein was the first to explain the link between extreme wealth and economic instability. He did so in 1949. He explained how the first Great Depression was actually caused by a massive transfer of wealth from poor to rich. He predicted that it would happen again. We are about to witness the first ever GLOBAL DEPRESSION. Amazing. The prosperity of an entire world is about to be compromised. Almost entirely because of greed. IT WILL BE OUR DOWNFALL. The point about our government printing up more money was that it can't be done "on a whim" and that there are serious concequences for doing so (weak dollar, higher gas prices, inflation). I never said that it can't be or hasn't been done at all. Afterall, those loans from china weren't infused in the form of Chinese currency. They were infused in the form of our own. Not given to the middle class but instead to the banks in the form of credit. Its done nothing but perpetuate the problem. It never has been and never will be the answer. Sorry if I wasn't explicit enough the first time. The original draft was written 2 years ago and intended to fit within 300 characters. That was until I lost my ISP for posting 'spam'. Anyway, I'm no English major. So if any of you want to re-word this post, feel free to do so. Whatever it takes to make people understand. The point about our government printing up more money was that it can't be done "on a whim" and that there are serious concequences for doing so (weak dollar, higher gas prices, inflation). I never said that it can't be or hasn't been done at all. Afterall, those loans from china weren't infused in the form of Chinese currency. They were infused in the form of our own. Not given to the middle class but instead to the banks in the form of credit. Its done nothing but perpetuate the problem. It never has been and never will be the answer. Sorry if I wasn't explicit enough the first time. The original draft was written 2 years ago and intended to fit within 300 characters. Anyway, I'm no English major. So if any of you want to re-word this post, feel free to do so. Whatever it takes to make people understand. The Web bot predicted a 9/11 like event would happen TODAY!!!!! Guess what, nothing happened. The stock market went down a lot but nothing even close to a 911 event. PLEASE I am begging you stop with the crazy posts. This was one of the only UFO sites that looked at things with reason and logic and not blind faith. Don’t get me wrong, its your blog and you have every right in the world to post whatever you want but I think a lot of your viewers liked the way the site was before. Yes we are headed for a very bad recession and it is important that everyone get there houses in order; but it did not take a magical computer program to see that. A lot of the very top economists have been warning that this was coming for years now. Greenspan was bad mouthing the economy over 6 moths ago and everyone attacked him for it. Cheney dumped all of his US dollars for other currencies over a year ago. This did not just happen; anyone who was looking could have seen it. "born poor, die poor." Im not the ones with the huge credit debt. money markets. stock options. im poor. i live comfortably. happily. curiously. all the money in the world couldnt buy me. this whole "crisis", as its called... is B.S. it only effects the lower tier of rich poeple. this will knock down alot of the stock market gamblers. impose new restrcitions on trading. i see it as a controlled program to eliminate the masses of "rags to riches" traders. it is meant to exclude the public form the market place. thinning the herds. call it what you will. it will have very little effect on poor people. who already know how to survive with limited means. Listen, whatever happens, happens. There's nothing anyone of us can do to change this. Everyone of us had a hand in making this mess, so now we all have to lay down in it. We all voted for who's in office and we are all a part of one society, the society of the United States of America. None of us should be pointing a finger anywhere. Our greed kills us and so do all of our sins. Think about this: IT'S IN OUR NATURE TO DESTROY OURSELVES!!! Welcome to the TRUTH! I see more value in learning to grow your own food and generate your own electricity than remaining in a dead end job that takes up 60-90% of your waking life, or trying to explain the causes of our situation. The reality is that the system in which our society exists is vastly unsustainable in every department. This is not bad, its just because nothing in the universe stays the same. Everything in this material universe goes through cycles, and our cycle of energy changes wont be stopping for anything. We must just learn to adapt to the changes coming our way. So the money might dissapear, so what. Surely we can muster enough human genius and learn to live by our selves again. The entire animal kingdom manages rather well. We just have to make a big extraction now while we can, and sever our ties with as many aspects of the dying system as bearably possible. The extent of your extraction will be directly proportional to your understanding of the scale of the situation we find our selves in. The most valuable investment we can make during the next two to five years, is establish a self sustainable home base for no more than 30 people per module. These modules will be like seeds that will survive the coming drought, and will become the centre points around which the new culture of sustainable consciousness will spread. Make it your ambition to find some land relatively far from the built up places, but not too far, and create the living module according to timeless permaculture principles. Learn to make simple durable wind turbines. They will be very very valuable in the future as we find the need to get off the grid, voluntarily or not. They are not very expensive, and with a bit of research can be made by a novice metalworker/woodworker/. The electrics are also rather basic. Wether the coming changes are because of human greed/natural cycles/wrathful gods/crazy aliens who own us/Gods process of creational-experiencial-consciencous expansion, or all of the above, nothing matters more than to learn to adapt and survive the coming changes/challenges. Get out of the sinking ship. Promote deconsumption in every department, exept in the 'will to rise above the challenge' departments. Network untampered-with seeds amoung yourselves with discretion. Seeds will be our survival, but they are planned by the elite to be our downfall. Watch the quality of our food deteriorate over the next 24 months. Pure untampered with seeds will be worth more than gold in the coming years. What was the DJ numbers at first fall? 777......fu** up, Aint it? Who among us believes that 2009 is the last good year in America?????????????????????????????????????????????????????????????????????????????????????????? What do you think this Christmas/New Year 2010, is going to be like?? ?